Dèesse Magazine: Fresh Dose of Pampering ! Fresh Dose of Pampering ! FarmHouse Fresh™ is definitely taking me back to a time when things were much simpler(not that I was an adult then.. but you get my drift) with these very refreshing products - from the Honey Heel Glaze (pictured, top left /$24) , Fine Foot Scrub Trio - Early Apple/ Whipped Honey / Sweet Cream ( pictured, center $52 / 10.5 oz $24 each) , to the delicious Sweet Cream Body Milk (pictured, top right / $26) . These products feel as if they're made personally for you with a lot of care ( that you can only get from your Dear Sweet Grandmother). 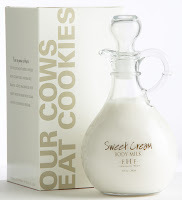 I just love the glass cruet that the Sweet Cream Body Milk comes in to the point I don't want to even use it. When I feel it's velvety goodness, it's soooo worth it !!! 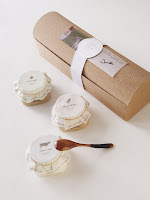 The fabulous Fine Foot Scrub Trio are on Oprah's Favorite! March 2007 O-List ! - Need I say more?? For more information , and to purchase check out FarmHouse Fresh™ online. the Heel Honey looks Yummy !! !